The New Palestine boys tennis team beat Mt. Vernon 3-2 Tuesday on the Dragons’ Senior Night. The victory gave the Dragons a 6-1 mark and second place in the Hoosier Heritage Conference behind powerhouse Delta. Matthew True won 6-0, 6-1 at No. 1 singles to cap off his home career. He finished 23-5 over four years against conference foes and has 72 varsity wins with one regular season match remaining. At No. 2 singles, Carson Gavin posted a 6-3, 6-3 victory to give the Dragons a second point. After the Dragons’ Jeremy Wagoner/Ethan Haeberle dropped No. 2 doubles 6-4, 6-3 and No. 3 singles Trevor Darley fell 6-3, 6-4, the victory hung in the balance at No. 1 doubles. Dane Reid/Ben Blachly rallied after dropping the first set to win the next two and give the Dragons the victory with a 6-1 win in the third set. NP is now 13-3 on the season. The Dragons travel to Chatard for the regular season finale Thursday. 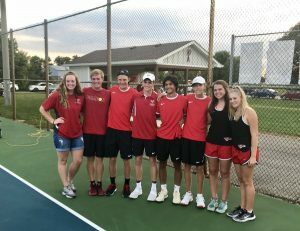 The New Palestine tennis seniors celebrate before the match against Mt. Vernon.